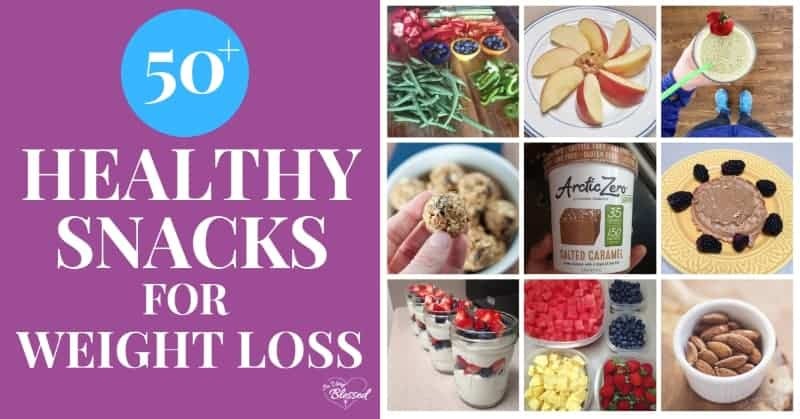 In this list of over 50 healthy snacks for weight loss, you will find sweet options, salty choices, grab and go snacks for work and school, and the best late night snack options. 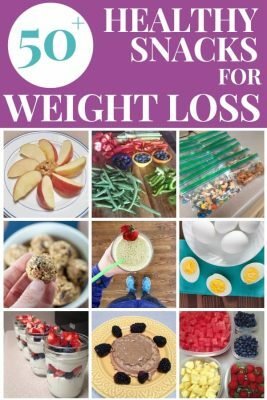 I have lost 100 pounds on my weight loss journey and choosing healthy snacks was a hugely important part of that. Before I started losing weight, my snacking included mostly treat food – Little Debbie Nutty Bars (still my favorite! ), chips, fruit snacks, and all kinds of other junk food that I loved. One of the things I had to do when I started trying to lose weight was redefine the purpose of snacking. 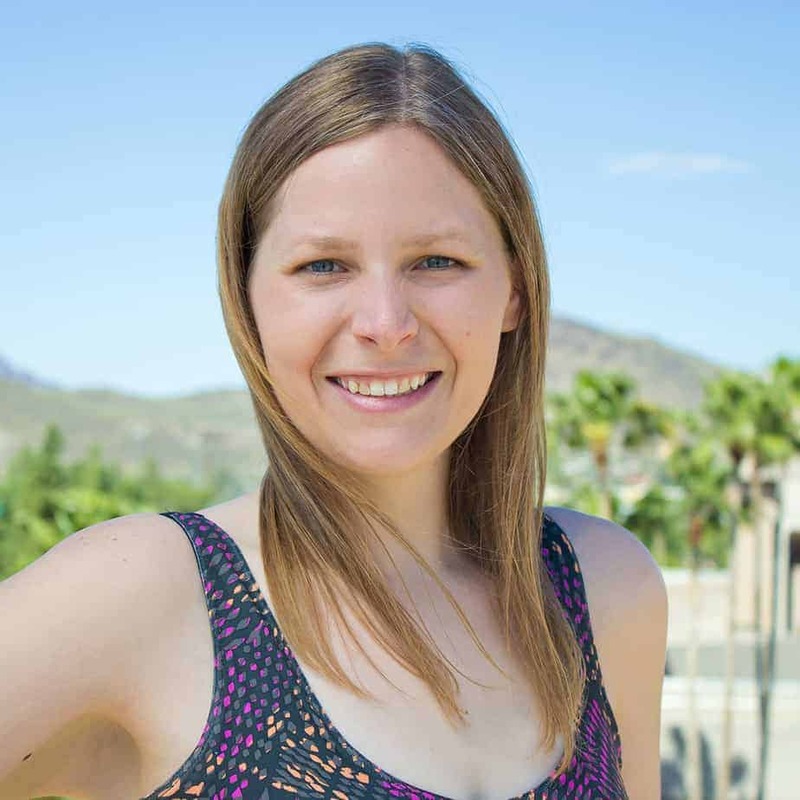 It could no longer be me just following my cravings and eating whatever I wanted (if only eating a family size bag of Cheetos could have helped me lose weight!). Instead, I starting reaching for snacks to satisfy my hunger, not as a result of emotional eating or sugar cravings. How Do You Know If A Snack Is Healthy? Here are a few questions I used to help me determine if a snack was healthy for my weight loss journey. #1 – Will it keep me full? I may be craving Cheetos for a snack, but even if I stick to one serving, I know those 21 pieces won’t keep me full for more than 5 minutes. Two things that help to fill you up and keep you full are protein and fiber so try to pick snacks that have plenty of them. #2 – How many calories does it have? 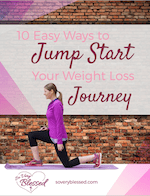 I’ve talked before about how I don’t think calorie counting is the ultimate answer when it comes to losing weight, but the fact of the matter is, you can’t eat more calories than you are burning and expect to lose weight. Even after losing 100 pounds and maintaining it for years, when I am looking at a new snack, the first thing I look for is the calorie count. There are low calorie snack options that are filling, healthy, and satisfying, but a surprisingly high number of “healthy” snacks (think things like trail mix and granola) are super high in calories. #3 – Is It Real Food? I know I just talked about paying attention to calories, but I am also NOT a fan of zero calorie processed foods. I don’t go for zero calorie salad dressings or sweeteners. They tend to be very processed and…well…fake. Fresh foods always trump processed foods, though you will find a mixture of produce and packaged foods (like protein bars) on the list below. The less processed, the better! 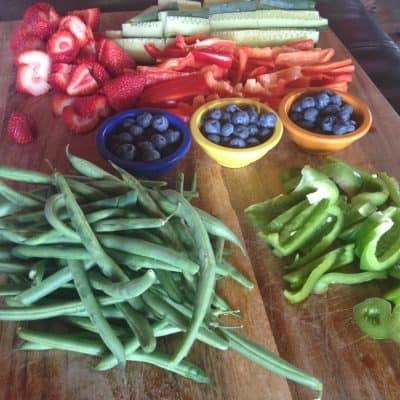 Here are some easy healthy snacks that are low calorie and can still satisfy your sweet tooth. 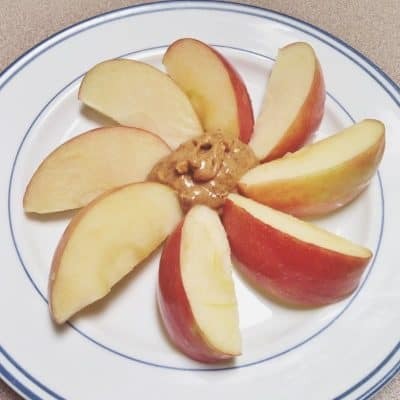 This delicious combination gives you protein from the peanut butter and fiber from the apple for a satisfying snack. Making your own baked apple chips from scratch is ideal, but if you don’t have the time to make them homemade, Bare Apple Chips are ready-to-eat and so delicious! 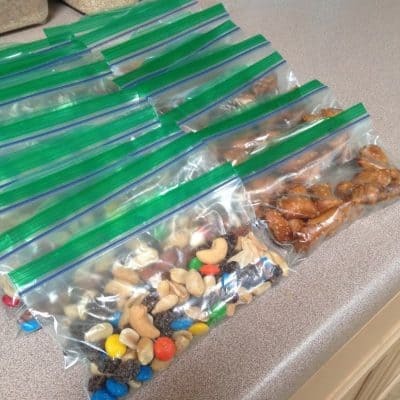 You can custom blend your own trail mix, using your favorite nuts and dried fruits, or buy one ready-made. They have some great options at Sprouts! Because nuts and dried fruit pack a high-calorie punch, I highly recommend you use plastic baggies to put these into single potion sizes as soon as you bring the package home. You can also buy them in individual packages like these that are ready to eat. 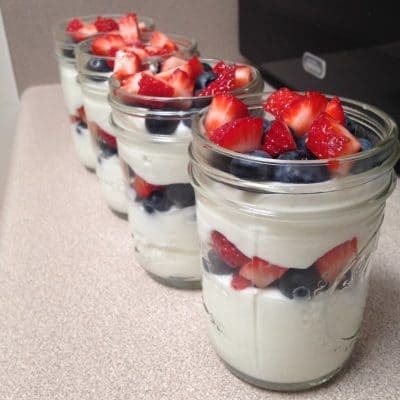 Greek yogurt is a great choice for a healthy snack because it has a lot of protein. The biggest area to watch is the sugar content. Plain yogurt is the best choice and you can add your own honey and fruit (just don’t go overboard!). 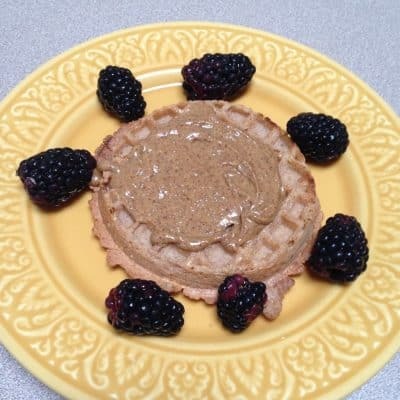 Frozen waffles are so convenient to grab and toast and adding a bit of preserves makes it sweet and delicious. Just watch the amount of sugar in your strawberry preserves! My favorite kind is Smucker’s Simply Fruit Strawberry spread that doesn’t have any added sugar, which is NOT the same as their sugar free version that uses artificial sweetener (I try to avoid those whenever I can). I absolutely love the crunch of cereal and it can make a great snack option as long as you steer clear of the sugary cereals. Oatmeal is traditionally a breakfast food, but it makes a delicious snack choice, too! It’s a whole grain that is slow to digest, which means it keeps you full longer. 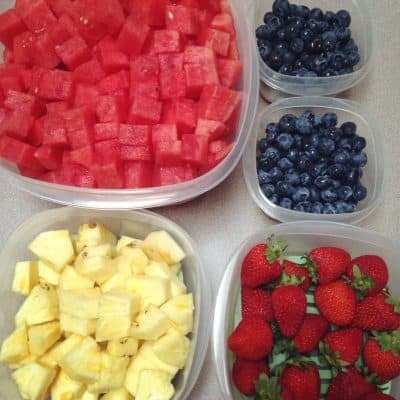 Add a little bit of honey and fruit for sweetness! Whole wheat English muffins are high in fiber and low in fat – a great combination for weight loss! Chia seeds are labeled a superfood because they pack a powerful punch of fiber, protein, antioxidants, vitamins, minerals, and more. Using them to make a pudding with a little bit of sweetener makes for a unique healthy snack. This is definitely not a whole food option and I usually recommend eating food that involves chewing because it tends to feel more satisfying than something you just drink. All that being said, a whey protein shake can be a quick, easy option for a healthy snack. 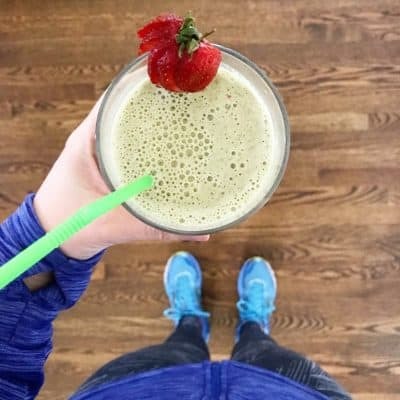 The best part about green smoothies is that you can get a serving of vegetables in without feeling like you’re eating vegetables. When it comes to dessert, I am a cake person. Obviously, making an entire cake isn’t good for weight loss, but mug cakes are already portioned into serving sizes and this one uses healthier ingredients making into a healthy way to indulge. Larabars are a great “sometimes” option when you’re on the go. They use real natural ingredients (primarily nuts and dates) without preservatives. Watch the sugar levels in some of the flavors, but the sugar is from the dates – no added sugar in these bars. 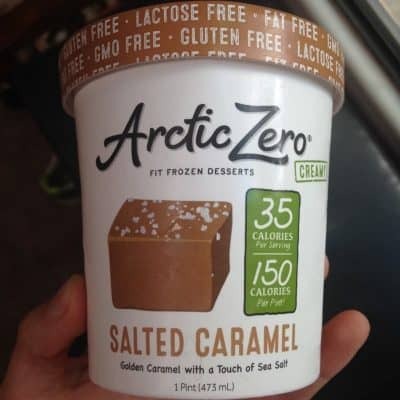 If you are craving ice cream but aren’t ready to blow a ton of calories on it, ice creams like Arctic Zero and Halo Top are great low calorie options. If you’re wanting something crunchy and salty but still good for your weight loss, kale chips are a great option. You can make them yourself at home or buy them ready to grab and go. Here is another salty, crunchy option for your snacking. Chickpeas are loaded with fiber, making them a fantastic weight loss snack. Get creative with different flavors you can make at home or just grab a bag like The Good Bean makes with flavors like Smoky Chili Lime or Sweet Sriracha. Popcorn is a whole grain that is low in calories and high in fiber. You get into trouble when you cook it in oil or add butter for flavoring, but air popped pocorn is a great snack for weight loss. You can get an air popper for under $25 on Amazon that will let you make weight-loss-friendly popcorn at home and, just like with roasted chickpeas, you can play with different spices and seasonings to make it flavorful and delicious. 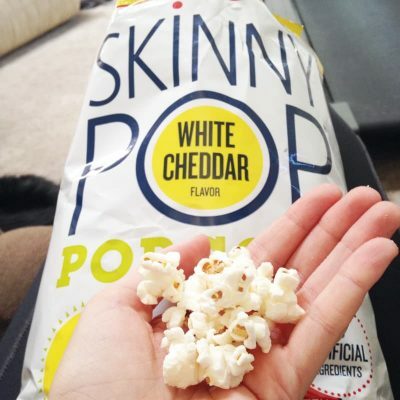 If you want somebody else to do the popping for you, Skinny Pop is a great option (I love their white cheddar flavor!). Making baked zucchini chips is a great way to break out of your normal snacks and try something new. These chip alternatives are a great way to use a light and healthy substitute to curb your chip cravings. Traditional french fries are absolutely delicious, but definitely not a food that will help you on your weight loss journey. Oven-baked sweet potato fries are easy, healthy, and absolutely delicious. Cottage cheese is a low-calorie cheese that is high in protein and calcium. It makes for a filling and satisfying snack, especially when paired with fruit! String cheese is naturally low in calories and offers you a lean protein snack choice. The higher sodium is the only thing to watch, but it is an easy-to-grab quick snack for any time of day! Jerky (like this Jack Link’s turkey jerky) is a protein-packed snack that doesn’t require any prep at all. Like the string cheese, be careful with jerky if you are watching your sodium, but it makes a great snack on the run! Edamame is a legume that is high in protein and fiber and low in calories, making it a perfect snack for weight loss. You can steam, boil, or microwave the pods and sprinkle them with sea salt or buy them roasted and ready to eat. Use 4 deli turkey slices (I recommend getting nitrate-free), spread 1/2 Tbs of Neufchatel cream cheese on each slice, then roll it around a sliced cucumber spear. Hummus is made using chickpeas, so it makes for a healthy dip to use for all kinds of vegetables. 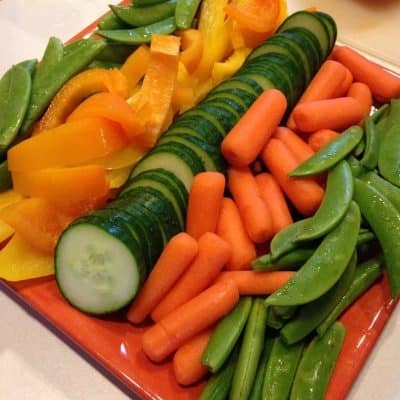 For veggies, you can use bell pepper strips, baby carrots, sugar snap peas, broccoli, cauliflower, cherry tomatoes, cucumber slices, jicama sticks, and more. 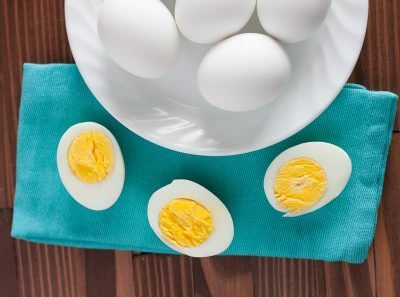 Hard boiled eggs are portable and full of protein for a healthy weight loss snack. I highly recommend making hard boiled eggs in your Instant Pot if you have one! You can make a lot at once (or just a few if you want!) and they are SO easy to peel! 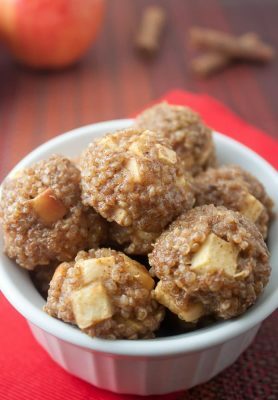 I am a tad quinoa bite crazy because they are a healthy snack you can make-ahead, freeze, and pull out as many as you want when you want them. I have a ton of different quinoa bite flavors to choose from, everything from barbecue chicken (my personal favorite) to apple cinnamon. If you are looking for healthy snacks that you can easily take to work, school, or anywhere on the go, you’re in the right place. These snacks are portable, healthy snacks on-the-go. Fruit is always a good option for a grab-and-go snack. Here are a few of the most portable fruits that are easy to eat on the run. The soft texture of cream cheese with the crunch of celery makes for a delicious snack. I opt for Neufchatel cream cheese because it’s lighter than the original, but I don’t notice a difference in the taste or texture that I do with fat-free cream cheese. If you’ve never had jicama, now is the time to give it a try! It has the texture of an apple, but without the sweetness. Some stores sell it already sliced, but if not, you can peel it or slice it yourself (it looks kind of like a coconut on the outside). Jicama makes a great dipper and the healthy fat of the avocado in guacamole makes a satisfying mid-afternoon snack. Pumpkin seeds, also called “pepitas” are high in antioxidants, magnesium, and fiber. They are also a great source of protein. Raw pumpkin seeds are delicious, but roasted pumpkin seeds make a tasty, salty snack. This low carb, protein-rich seed also has healthy fats, which are great in moderation! You get bonus points for shelling them yourself. 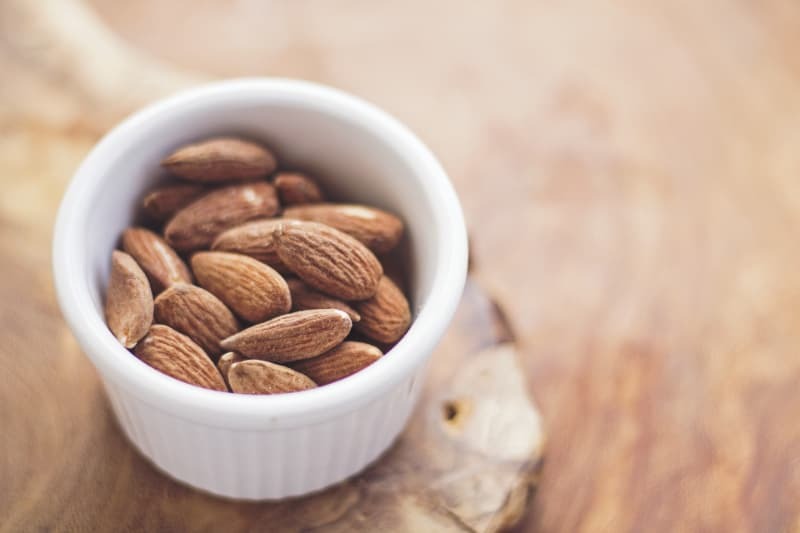 Almonds are a heart-healthy choice that is high in protein. With all of these nuts and seeds, they make a great on-the-go snack, but it’s best to portion them out in individual serving sizes so you don’t overdo it. Dried fruit is such an easy snack to package up and take with you. Just remember that even though the water was taken out of the fruit, all of the sugar is still there. When you don’t have time to prep a snack, it’s nice to have packaged foods that are already in portion-sized packets like Justin’s. It’s hard to beat a snack of crackers and cheese for an afternoon snack. The light Laughin Cow cheese triangles only have 25 calories per wedge and it spreads well on Triscuit crackers. Tuna pouches are another convenient healthy snack that you can keep around for times when you didn’t plan ahead. Keep these in your desk to use as a last-minute snack or lunch. You can go for plain tuna, but Starkist makes some delicous flavors like sweet & spicy, herb & garlic, and hickory smoked. Spread some tuna on some crackers and you have a filling, satisfying snack. Energy bites are all the rage right now for good reason! They are delicious, easy to prepare, and you can make them ahead of time (I like to keep a batch in my freezer). 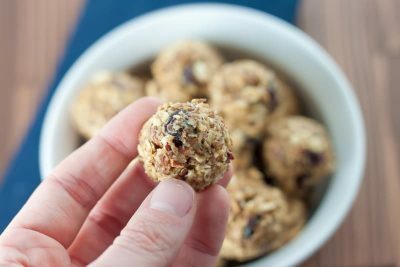 Try these Cranberry Almond Energy Bites. Baked pita chips are delightfully crunchy and satisfy your chips and dip cravings in a healthier way. Applesauce cups are super convenient and easy to grab. I’ve even been known to “drink” them out of the cup when I’ve forgotten to grab a spoon. Sprinkle on a dash of cinnamon for extra flair. There are recipes out there for you to make homemade fruit leather at home, but if you’d rather just buy a snack to have ready-to-eat, Stretch Island makes a bunch of delicious flavors like strawberry, grape, raspberry, and apple. Rice cakes have gotten a bad rap over the years as being a “tasteless” health food, but I’m quite fond of them. They are salty, crunchy, and beautifully low in calories. These cheese wheels are easy to grab and ready to eat on-the-go. They are low calorie and high in protein, so it’s a snack that will help fill you up in the middle of the afternoon. I try to eat whole foods more often than not, but when I reach for a pre-made bar, this is the bar I reach for. 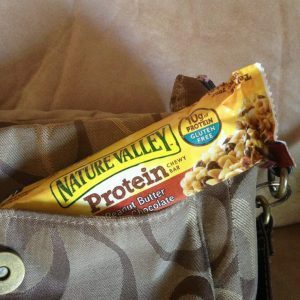 Compared to many granola bars, the Nature Valley Peanut Butter Protein Bar is lower in sugar, it tastes absolutely amazing (hello, chocolate and peanut butter! ), and the added protein helps to keep you full. When it comes to nighttime snacks for weight loss, it’s important to be careful. In the evenings, your willpower is running low, so you don’t have the same self-control that you might have first thing in the morning. That means, the WORST foods to reach for in the evenings are the foods that are most tempting to you – things ice cream, cookies, chocolate, and chips. The other thing you need to keep in mind is that certain foods can affect your sleep. The caffeine in chocolate, for example, may not be much, but it keeps me up at night if I eat it after 4pm. Sugary foods (breakfast cereal, pudding, etc) can not only prevent you from falling asleep and it can cause you to wake up hungry the next morning. Foods that contain caffeine (chocolate, hot cocoa, and even decaf coffee contains caffeine!) can obviously keep you awake at night. Overeating. Not only will that sabotage your weight loss, but it also keeps you from sleeping well. On the other hand, dried tart cherries are actually a natural source of melatonin and can actually help you sleep. Healthy bedtime snacks should include some complex carbohydrates, protein, and a bit of calcium. Here are some low-calorie nighttime snacks. A natural source of melatonin, dried cherries are an ideal bedtime snack as long as you can stick to an appropriate serving size! It’s easy to overeat dried fruit because it’s so much smaller than the whole fruit, but all of the calories are still there! Turkey has tryptophan, which is great for helping you sleep! This post came right on time!!! Thank you so much! You are so welcome! I’m always trying to remember new healthy snack ideas off the top of my head (and never can), so I thought other people would appreciate having a long list of options, too!